So we finished our Whole30 a little while ago and I’ve been giving a whole lot of thought about the key lessons/takeaways. for our family. We’ve had a handful of meaningful Whole30 takeaways that we have applied to our everyday life over the last few weeks. First, focusing on Non-Scale Victories (NSV) is liberating. We’ve essentially thrown the scale away by storing it out of sight/out of reach. It now takes effort to weigh ourselves and instead of stepping on daily we focus on how we are feeling, how are clothes are fitting and how we are sleeping at night. Not being tied a number is absolutely freeing. We were meal planning more effectively. What I really mean is we actually planned our meals ahead of time. This could mean buying in bulk and saving money or just reducing our overall waste. We also ate leftovers as part of this plan which we almost never did in the past. And we ENJOYED it. For all of you out there who have been rocking a meal planner for years I bow down to you. We stopped eating out. It use to be so easy to make a stop thru a drive thru after a busy day for a quick dinner or to go through the Tim Horton’s drive thru for coffee and a snack easily spending $20 per drive thru attempt (and sometimes more). Yet we’d balk at spending $15 on lamb chops that were fresh, tasty and marinated in a Whole30 approved manner. Lets think for a minute – unfulfilling hamburger kept warmish under a heat lamp or tasty lamb chops with a salad or sweet potatoes. Which sounds better? I started taking my lunch to work which typically consisted of leftovers. It is nearly impossible to buy lunch in downtown Toronto for less than $10 a day so easily saved $40-50 a week and I eliminated my morning $5 Starbucks run because they didn’t have any Whole30 non-dairy compliant milk. Now, three weeks later and I’m still taking my lunch to work. I feel more satisfied and I’m saving money and time. We’ve eaten out once since finishing and we didn’t even enjoy it. I remember looking at my husband after taking a couple of bites and we both had the same reaction – we could have made this at home and it would have been 100% better. Third, Whole30 is a black and white, yes or no diet. This is why I found it so easy to follow – while it does. There is no counting “points” or complicated formulas and nothing is really open to interpretation. For some people this is viewed as very restrictive or limiting but for me it made simple to stay compliant. Even now that we are being less strict and affording ourselves the occasional cheat the black and white nature of eating clean the Whole30 way lets us be “accurate” when we say we are achieving our goal of eating 80% compliant. It isn’t subjective. Lastly, I lost all cravings for sweets, chocolates while doing Whole30. This was/is a big deal for me since I have always had a sweet tooth. Since I no longer have the same cravings, I’m no longer the person who always takes a chocolate when they are passed at work or that attacks the vending machine or takes a bite from my daughter’s treat. This doesn’t mean I won’t ever enjoy a slice of cake again but it does mean that when I do, it is because I’ve made a conscious decision to enjoy it and I’m not just reacting to a momentary lack of willpower. I’m proud of the changes we’ve made in our day to day life to eat better, eat fresher and to get a little more creative in the kitchen. 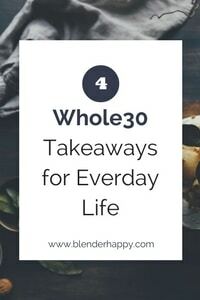 What are your favourite Whole30 takeaways? Hi, glad to hear that you are mostly sticking with the Whole 30 plan. Mine favorite is also the lack of sugar cravings. That being said I have added dark chocolate back occasionally and really enjoy it when I do. So far it hasn’t brought back any cravings but I stay very aware of how I feel after adding back foods. I think awareness is one of the most important things learned on Whole 30. I’ve been amazed at the few times that I’ve had a treat that I haven’t really enjoyed it all that much. It makes it easier to make the decision to just skip the dessert or ice cream (even when others are clearly enjoying)!